Buckwheat hulls, generally discarded as waste, have been known to possess various flavonoids and high antioxidant activities. The objective of this study was to determine effect of extracting solvents [water, ethanol (20%, 50%, 80%, and 100%), methanol, and acetone] on total phenolic content, flavonoid content and composition, and antioxidant activities of common and tartary buckwheat hull extracts. Antioxidative effect of common and tartary buckwheat hull extracts on lipids in mayonnaise was also investigated. Vitexin, isovitexin, isoorientin, orientin, rutin, isoquercetin, and quercetin were identified in the common buckwheat hull extracts, while rutin, quercetin, isoorientin, and isoquercetin were in the tartary buckwheat hull extracts. The methanol and 80% ethanol extracts had more flavonoids than the others, while the aqueous ethanol extracts from both of the hulls had more total phenolics and antioxidant activities. 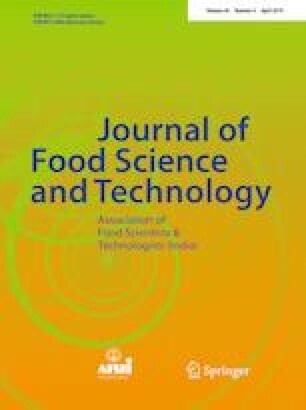 Oxidative stability of lipids in mayonnaises added with common and tartary buckwheat hull extracts (0.02 and 0.08%, w/w) prepared by 50% ethanol were higher than that in the mayonnaise with butylated hydroxytoluene (0.02%) and control. Oxidative stability was not significantly different between the mayonnaises added with the two buckwheat hull extracts. BIP conceived and designed the study and KTH organized the whole research outline. All experimental works were conducted and the manuscript was written by BIP. JK assisted extraction of buckwheat hull extracts and HPLC–UV analysis. KL offered scientific advices on the LC–MS. TL offered scientific advices on mayonnaise oxidation study. Manuscript drafting was corrected by KTH and BIP. All authors have approved and reviewed the final manuscript.